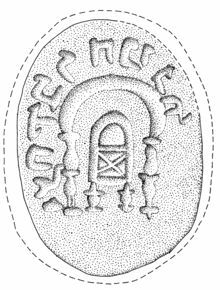 Ring-stone of Yishak bar Hanina with a Torah shrine, 330 BCE - 200 CE or later. Late Roman period amphora from Zafar originated at Aqaba, Jordan. Relief which shows a man wearing a crown, c. 450 - c. 525 CE?, perhaps a representation of king Sumūyafaʿ Ashwaʿ. Ẓafār or Dhafar (Arabic: ظفار‎) Ðafār (museum: UTM: 435700E, 1571160 N zone 38P, 14°12'N, 44°24'E, deviating slightly from Google Earth) is an ancient Himyarite site situated in Yemen, some 130 km south-south-east of today's capital, Sana'a, and c. 10 kilometres (6.2 mi) southeast of Yarim. Given mention in several ancient texts, there is little doubt about the pronunciation of the name. Despite the opinion of local patriots in Oman, this site in the Yemen is far older than its namesake there. It lies in the Yemenite highlands at some 2800 m. Zafar was the capital of the Himyarites (110 BCE - 525 CE), which at its peak ruled most of the Arabian Peninsula. The Himyar are not a tribe, but rather a tribal confederacy. For 250 years the confederacy and its allies combined territory extended past Riyadh to the north and the Euphrates to the north-east. Zafar was the Himyarite capital in Southern Arabia prior to the Aksumite conquest. From an archaeological perspective, the settlement's beginnings are not well known. The main sources consist of Old South Arabian musnad inscriptions dated as early as the 1st century BCE. It is mentioned by Pliny in his Natural History, in the anonymous Periplus of the Erythraean Sea (both 1st century CE), as well as in the Geographia of Claudius Ptolemaeus (original 2nd century CE). At some point, presumably the medieval times the coordinates of the Ptolemy map were incorrectly copied or emended so that subsequent maps place the site Sephar metropolis in Oman, not in the Yemen. The Zafar in Yemen is more than 1000 years older than that place-name in Oman, assuming from the evidence in known texts (Smith 2001: 380). Written sources regarding Zafar are numerous, but heterogeneous in informational value. The most important source is epigraphic Old South Arabian. Christian texts shed light on the war between the Himyar and the Aksumites (523 - 525). The Vita of Gregentios is a pious forgery created by Byzantine monks, which mentions a bishop who allegedly had his see in Zafar. It contains linguistic usage possibly of the 12th century CE. According to Arab geographer and historian, Al-Hamdani (c. 893-945), Zafar was also known by the name Ḥaql Yaḥḍib ("the field of Yaḥḍib"). Individual finds belong to the Himyarite early period (110 BCE - 270 CE). Rare earlier finds were probably brought to the site from elsewhere. Most of the ruins and finds, however, appear to belong to the empire period (270 - 525). A few post-war Ge'ez inscriptions have survived at the site. From the late/post period identifiable finds are few indeed at Zafar. After this there is little to suggest an occupation until recent times. The excavated finds are important because the texts shed little light on the material culture and art of this age. Moreover, recently the chronology of the main coin series has been attacked. Already an established big town, Sana'a and its fortress Ghumdan, replaced Zafar as capital probably between 537 and 548. The textual basis is thin regarding this topic. At the same time the archaeological record in Zafar and the surrounding region breaks off. No textual tradition articulates its destruction. Only an Aksumite church was recorded as being destroyed in 523.This church, likely built by the Christian missionary Theophilos the Indian, was destroyed by Dhu Nawas following the Himyarite conversion to Judaism. It was later restored after Aksum's successful invasion on Himyar in 524. There is evidence that Zafar and settlement in general in the Yemenite highlands declined drastically in the 5th and 6th centuries. Ideally, the viability of the city correlates declines drastically just after a relief of a crowned man was erected in what the excavator terms the Stone Building Site. The date of this relief and its inscription difficult, both perhaps to the mid 5th century. The occurrence in Zafar of ribbed amphorae manufactured in Aqaba/Ayla evidently in order to transport wine, shows the area just north of Aqaba to have been a fruitful agricultural area. On the other hand, D. Fleitmann has studied speliotherms from al-Hootha cave in central Oman and has gathered information for megadroughts especially around 530. These may have afflicted the entire Peninsula. We need a greater resolution in the dating of dry and wet events in order to understand the climatic differences between Aqaba, Oman and the entire region in point of time. A rectangular mapped surface area comprises 120 hectares. But the settlement is of uneven density and smaller than this. Zafar is the second largest mapped archaeological site in Arabia after Marib. Ancient settlement occurs inside and outside the ancient city defences. These have been estimated at 4000 metres long. The main fortress today is still referred to as the "Husn Raydan". A text by the medieval Yemenite author al-Hamdani mentions the names of city gates, most of which are named after the town to which they face. The main architectural ruins at Zafar include tombs and on the south-western flank of the Husn Raydan a 30 x 30 m square stone court, as preserved, originally probably a temple, to judge from the accumulation of cattle bones which it contained. It is located immediately north of a subterranean chambers and tombs. Immediately to the north are a row of storage chambers. The Husn Raydan and al-Gusr (standard Arabic: al-Qasr) 300 m to the north were once one fortification inside the city walls. Raydan South also was fortified and the ruined fortifications are best preserved here. Musnad texts mention five royal palaces at Zafar: Hargab, Kallanum, Kawkaban, Shawhatan and Raydan, the state palace. Smaller ones, such as Yakrub, also find mention. Nearby Himyarite period settlements include Maṣna‘at Māriya (ancient Samiʻān) and the Ǧabal al-‘Awd settlement, 25 air km to the south-east. From the 3rd to mid-6th centuries Zafar was a bustling international centre with a booming local and international trade. Yule estimated a 4th-century population of some 25,000, based partly on the surface area and population density. Evidence of trade comes in the form of Late Roman period amphorae such as that depicted below. Many were produced in Aqaba, Jordan as we know from excavations there. Aqaba was a center where goods were loaded, re-packed and re-exported. About 500 such sherds and vessels came to light in Zafar, the number rivalling that at Adulis and Aqaba. While wine is often mention as an import, livestock, textiles, meat, fish and fish sauce were also imported. The contemporary environment is vastly inferior to that which provided the resource base for the early Himyarite tribal confederation. Despite some 500 mm precipitation per year, Water is scarce, upland soils are chronically eroded; the tree cover was eliminated perhaps in the empire period. Given the exhaustion of natural resources, civil strife, epidemics and megadroughts the Himyarite period population declined especially in the 6th century. Today, some 450 farmers inhabit the former capital. Excavations at Ẓafār yielded 19 cultivated species including eight cereals, four oil and fibre plants, three pulses, three fruits and one spice. Hordeum is the most important cereal. The Stone Building also yielded most of 6000 excavated animal bones. The Stone Guilding seems to have functioned as a slaughterhouse. An early 6th century relief statue has been identified as a king of Byzantine type, perhaps a representation of king Sumūyafaʿ Ashwaʿ. 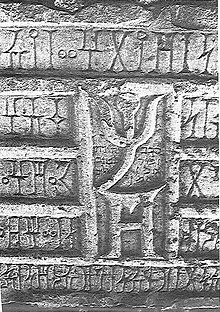 In 1970, Italian orientalist Giovānnī Garbinī discovered a Sabaean inscription on a column in Bayt al-Ašwāl near Zafar [Dhofār], whereon is engraved a later writing in Assyrian (Hebrew) script which reads: "The writing of Judah, of blessed memory, Amen shalom amen." The script is believed to date to the 4th-century CE. The inscription attests to the multi-ethnic make-up of the peoples of South Arabia at that time. Mapping and excavation through the University of Heidelberg continued from 1998 to 2010. In 2002, the site museum was reinstalled. In 2010, the Stone Building site was roofed and conservation measures carried out. Although the site is no longer accessible, there is a Zafar Virtual Museum. ^ M. Raith–R. Hoffbauer–H. Euler–P. Yule–K. Damgaard, Archaeometric Study of the Aqaba Late Roman Period Pottery Complex and Distribution in the 1st Millennium CE, Zeitschrift für Orient-Archäologie, 6, 2013, 320–350, ISBN 978-3-11-019704-4. Paul Yule, Himyar–Die Spätantike im Jemen/Late Antique Yemen, Aichwald, 2007, Template:ISBN 978-3-929290-35-6. Paul Yule, Late Antique Arabia Ẓafār, Capital of Ḥimyar, Rehabilitation of a ‘Decadent’ Society, Excavations of the Ruprecht-Karls-Universität Heidelberg 1998–2010 in the Highlands of the Yemen, Abhandlungen Deutsche Orient-Gesellschaft, vol. 29, Wiesbaden, 2013, Template:ISSN 0417-2442, Template:ISBN 978-3-447-06935-9. Paul Yule, A Late Antique Christian king from Himyar, Southern Arabia, Old South Arabia, Antiquity, vol. 87, issue 338, December 2013, 1124–35, Template:ISSN 0003-598x. Walter Müller, Ẓafār, Encyclopedia of Islam, vol. XI, Leiden, 2001, 379-80. This page was last edited on 3 February 2019, at 20:17 (UTC).